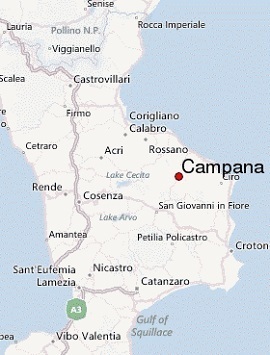 Of uncertain origins, Campana is a town and comune in the province of Cosenza in the Calabria region. According to popular traditions, it was once known as Kalasarna, founded by the Homeric hero Filottete, trusted companion of Hercules. 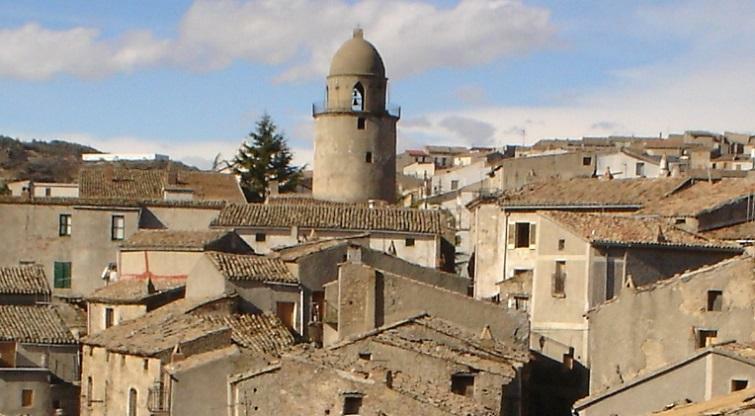 Traditions also suggest that the town could very well have been the founded instead by the ancient Oenotrian tribe. 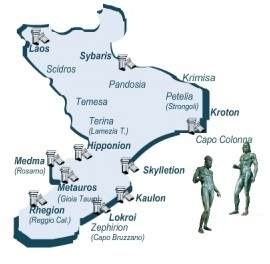 The Oenotrians ("tribe led by Oenotrus" or "people from the land of vines - Οἰνωτρία") were ancient people of unknown origin who inhabited a territory from Paestum (Campania region) to southern Calabria and was known as Enotria, the land of the wine. By the sixth century BC, they had been absorbed with other Italic tribes. The name change from Kalasarna to Campana would have been determined by the large town's bell (bell means campana in italian) which was to be used to alert and to rally the locals working in the fields of looming Saracen incursions. For centuries, perhaps millennia, defying time and weather, two titanic monoliths have been waiting for their rightful place and visibility in the archeological world. 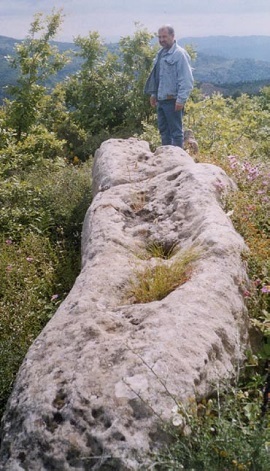 The "sculptures" stands on a singular rock formation consisting of two large blocks, each about ten,fifteen feet apart, with several overlapping layers of rock. Under the two figures in the block of rock below two small caves have been excavated, evidence perhaps of a subterranean civilization. 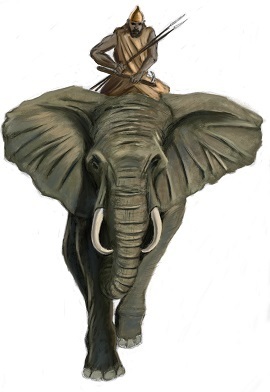 The first figure is an elephant about 5 meters high. The elephant is beautiful, impressive and dynamic at the same time. His trunk and tusks are very well marked, as if the work of a great artist. 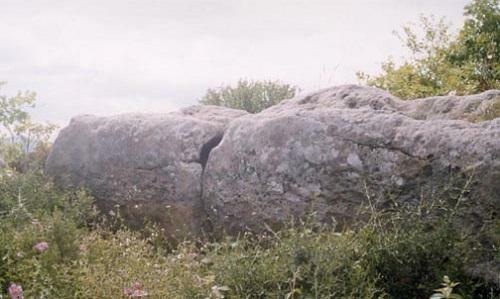 The second stone is more difficult to "read", perhaps the remains of a large statue? The missing upper part is partly lost and partly lying on the ground around. Below a reconstruction of what could have been. 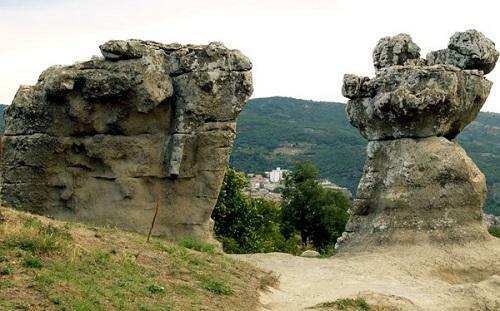 To attract a renewed interest in the beautiful stones of Campana, in the Sila Greca, was Dominic Canino a young architect from Cosenza with a recent article published in the "Calabria daily paper", followed by a documentary aired by the Italian TV station RAI. The "re-discovery" occurred almost by chance back in December of 2002, while the the young architect was in search of ancient coins . 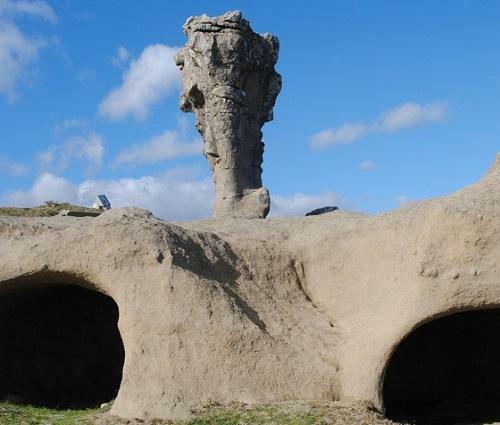 The area is well known for being a trove treasure for prehistoric findings, and its history can be traced back to the Iron Age. 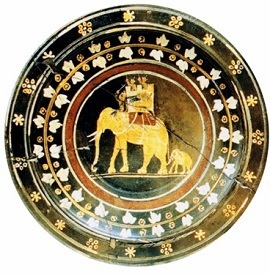 Many of the objects discovered over the years are now displayed at the museums of Reggio Calabria and Crotone. Evoked emotions are strong in the face of these two giants, and soon gives way to the questions: Who carved them? And when? 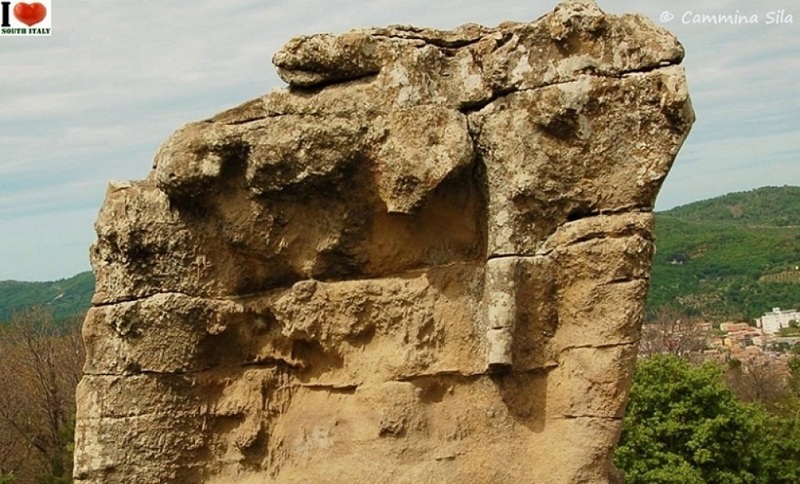 Was this the work of a lost civilization or simply the result of erosion? 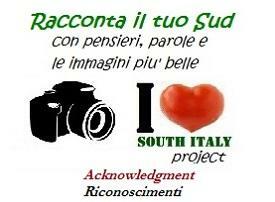 Following further searches in the hidden corners of the territory with a team of enthusiasts consisting of Gino Sapia, Peppe and Franco De Rose Affatato, we came out with two other interesting findings. 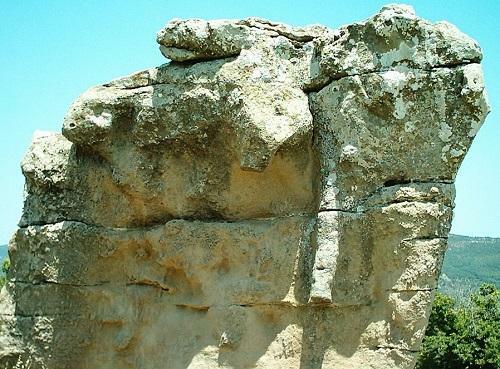 About 500 meters away from Elephant Rock, in the location known as "Pietra Pertosa", we found a sculpture of limestone carved by the same method representative of a large reptile with no legs, a sort of giant snake of approximately 10 meters. And then the final surprise: after a long chat with some elderly women near the Irto dell' Eternita', the ancient gateway to the historic center, one of them gets up, takes me by the hand and guides me to the brink of the precipice from where she shows me a huge rock in the distance and says: look at the stone of the giant whale, is more beautiful than the elephant! 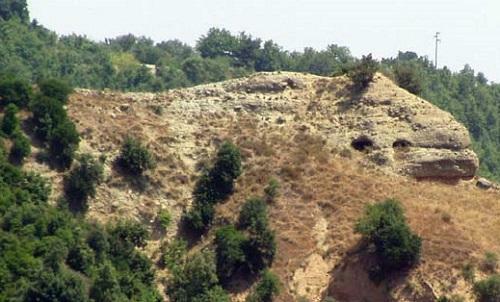 I was dumbfounded: a hill full of limestone in the shape of a whale. A mass of at least 60 meters visible from several miles away. We walk back to the stone elephant location for a better look and the forms take a more defined shape, just that of a big whale with its enormous head . After several hours of walking we finally reach the place, what looked from a distance as the eye of the whale, turns out to be a pair of caves like those caves underneath the elephant , only much larger ! 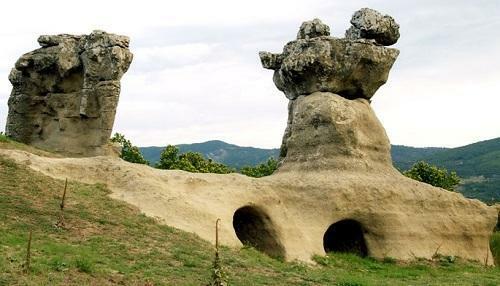 The two caves were dug deep into the rock. 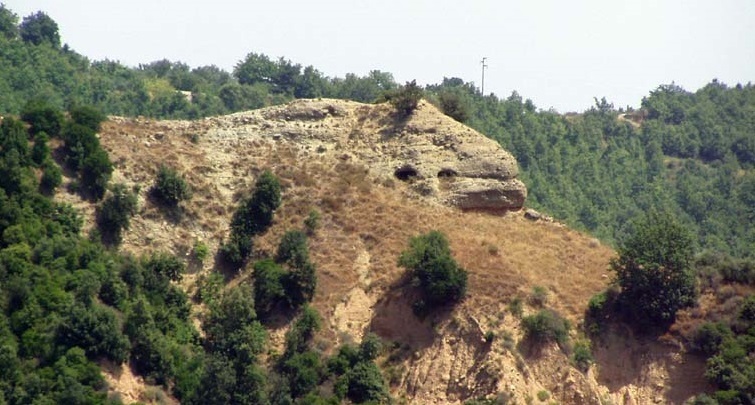 To give the impression of the mouth a horizontal grove is marked deeper into the rock revealing a different color. 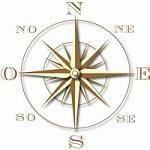 Directions: From Cosenza, via Camigliatello Silano on your way to Longobucco , you are in fact driving toward the 'other side' , the Ionian Sea (approximately 83km). 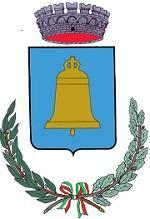 The locality is known as the "Incavallicata". The Romans called the area of Sicily and Calabria, Magna Graecia (Latin, “Great Greece”), since it was so densely inhabited by the Greeks. 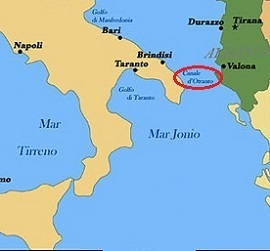 Oenotrians arrived in Southern Italy at the beginning of the Iron Age (11th century BC) from Greece through the Strait of Otranto together with other people of the same ethnic group. With this colonization, Greek culture was exported to Italy, in its dialects of the Ancient Greek language, its religious rites and its traditions of the independent polis. An original Hellenic civilization soon developed, later interacting with the native Italic civilizations. 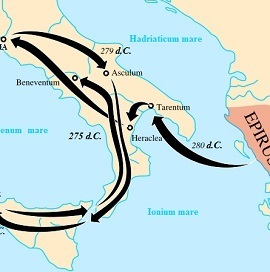 Worth noticing that colonization of Southern Italy took place in different stages, before the Trojan war and after. 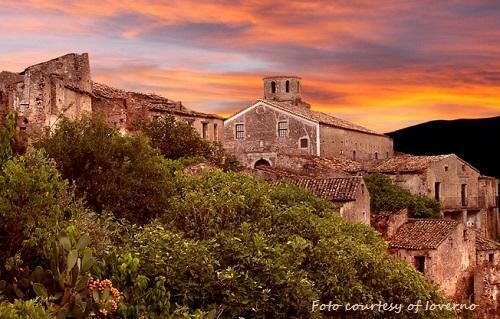 We do have in Calabria, a few towns where ancient Greek (Griko) is still spoken. 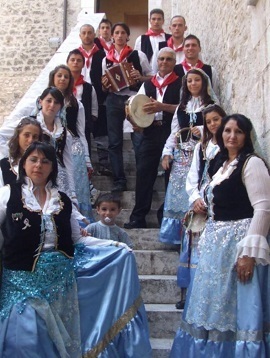 The Griko people (Greek: Γκρίκο) sometimes spelled Grico, Greco in Calabria, and also known as Grecanici, are found principally in regions of Calabria (Province of Reggio Calabria) and Apulia (peninsula of Salento). 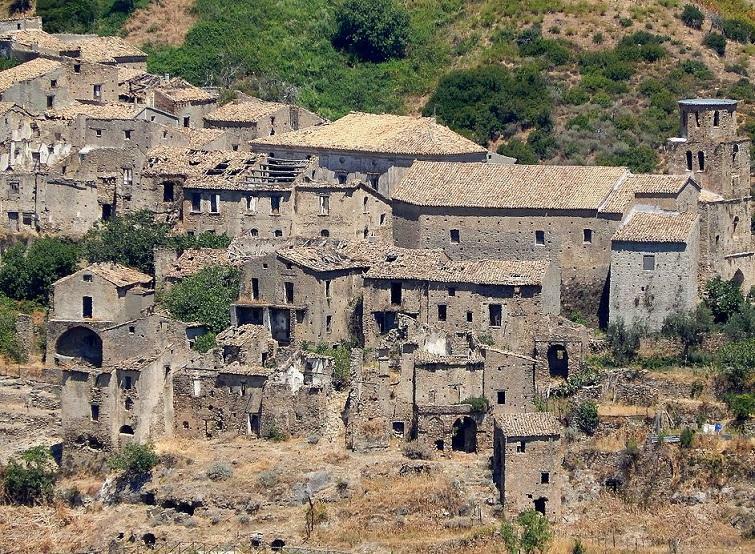 The Griko are believed to be remnants of the once large Ancient and Medieval Greek communities of southern Italy. 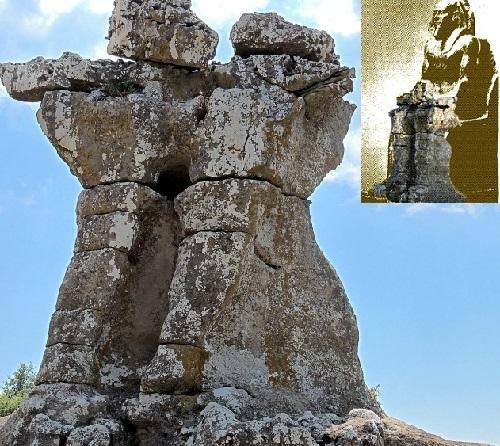 One other theory , matter of fact, is that the two stone 'giants' , have been carved by human hands in the period in which Pyrrhus and Hannibal colonized Italy as a tribute to those historical periods. 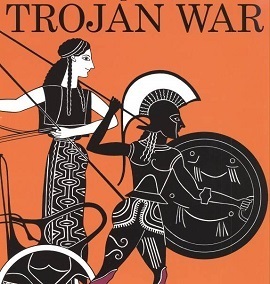 The Pyrrhic War proved both that the states of ancient Greece had essentially become incapable of defending the independent colonies of Magna Graecia and that the Roman legions were capable of competing with the armies of the Hellenistic kingdoms. 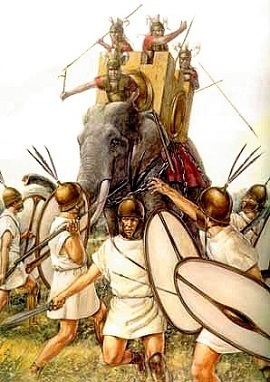 Rome's proven record in international military conflicts would also aid its resolve in its rivalry with Carthage, which was eventually to culminate in the Punic Wars. 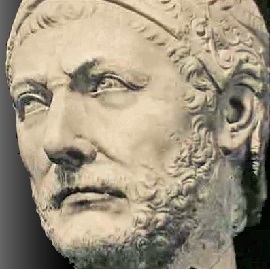 Hannibal, son of Hamilcar Barca, (248–183 or 182 BC), commonly known as Hannibal was a Carthaginian military commander and tactician who is popularly credited as one of the most talented commanders in history. 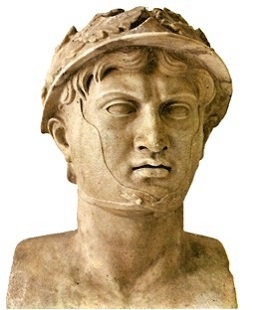 His father Hamilcar Barca was the leading Carthaginian commander during the First Punic War. La vetrina ideale per promuovere i vostri prodotti e servizi sul mercato Nord Americano ma che potrebbe essere un punto di visibilità anche nei vari mercati internazionali. Coloro interessati ad inserire la loro attivita'/azienda/ nel sito sono pregati di contattattarci .